My friends and I standing at the Falling Rock with Mystic Rock directly behind. 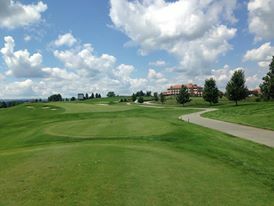 On Sunday, August 4, I had the honor of playing golf on the PGA-level Mystic Rock course at Nemacolin Woodlands Resort. 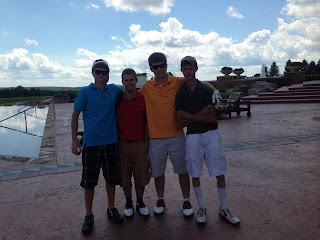 I enjoyed this outing with Ian, JR, and Joel, several of my good friends from high school. We had an amazing time and greatly enjoyed all that this course had to offer. Our day began a little after 9 am, when we drove from our condo to the Mystic Rock course. 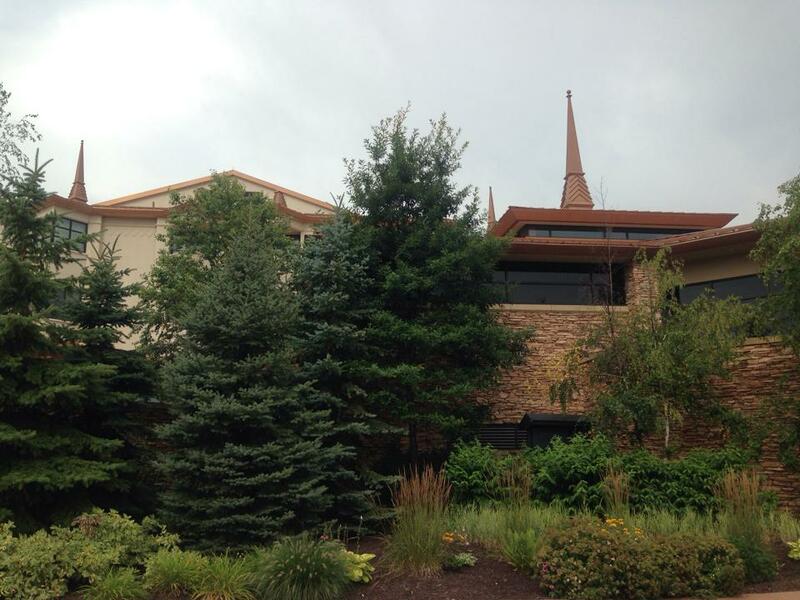 Upon searching for the pro shop, we were greeted by the elegant Falling Rock hotel, which housed it. Dedicating its design to Frank Lloyd Wright, one of the greatest architects in American history, it was one of the most beautiful buildings that I have ever seen. Upon walking to the pro shop, we were greeted by a jacuzzi housed between the steps. 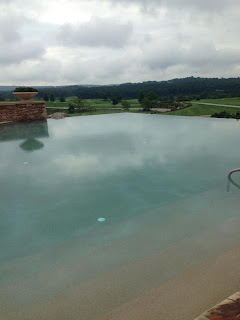 Directly in front of the pro shop was a beautiful infinity pool, in which the water appeared to touch the golf course. The infinity pool that appears to touch the greens. The people below the pro shop politely helped us load our bags and choose a cart, and we then made our way to the greens. We jumped into our cart - which we would soon find out was the coolest we had ever driven - and made our way to hole one. The computerized carts actually regulated the speed limit, allowing us to speed up as we exited the parking lot. However, get a bit too close to the green, and they nearly slow down to a halt until you make your way to the path. The course was one of the most beautiful I have ever seen. 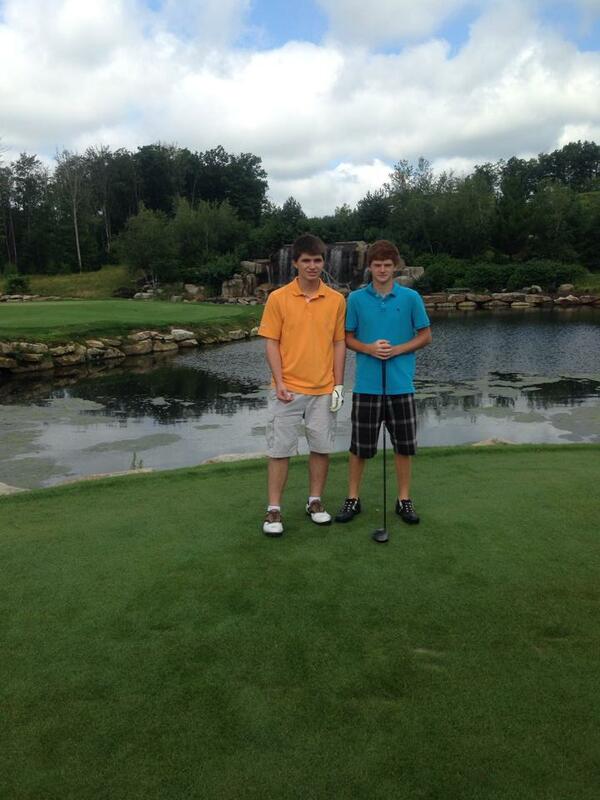 Bordering each hole were shining lakes, relaxing waterfalls, pompous stone cliffs, and majestic woods. 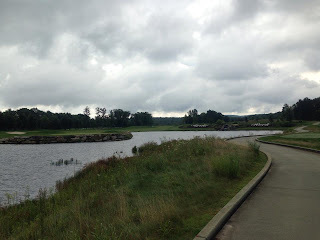 Being a pro course, many of the holes were quite challenging, yet even when you hit your worst drive, it was hard to become frustrated with the scenic nature around you. Perhaps my worst enemy on the course were the huge sand traps that made up many of the holes. They were the largest that I had ever seen, and escaping some of them proved to be quite a challenge. The course had many luxurious features, including a heated restroom in the middle of the course, in case you forgot to hit the restroom. In addition, an employee drove around the course with a snack and drink cart, so there was really no excuse for being hungry or thirsty at any point on the course. 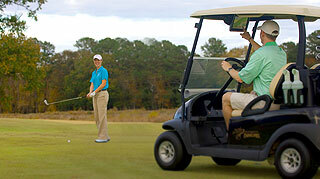 After hole eight, we were greeted by an awesome surprise: we could order food directly from our golf carts. I ordered the Mystic Burger and was filled with excitement when I saw the drive-thru directly after hole nine. 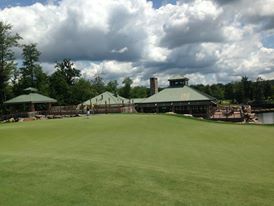 Mulligan’s was placed perfectly in the center of the course, with both the convenient drive-thru and a sit-down area. It even has a deck, on which guests can practice hitting balls into the lake behind. The golf cart from which we ordered our food was so nice that it deserves a paragraph to itself. Equipped with the Visage GPS System, it offered GPS tracking of other carts in blind spots, digital scorecards, and flyover views of each hole. Upon entering each tee box, the system spoke and gave us helpful advice on how to best approach the hole. It truly upped the experience to another level. Perhaps one of the most challenged holes on the course is the par 5 hole sixteen. First, we had to walk up a set of steps to get to the tee box. Facing us was a large cliff of stone, which we then had to drive our ball above. 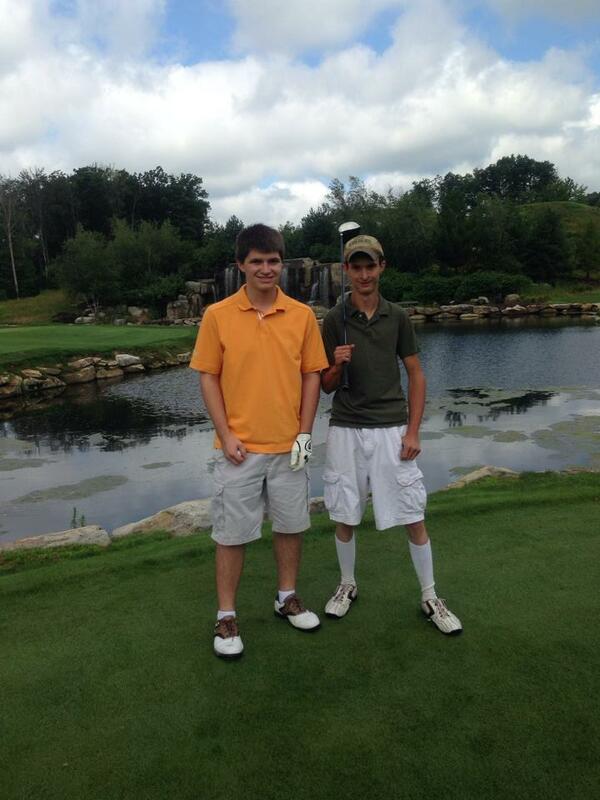 We then had to watch, as too hard of a hit could send our balls into the water that covered the green on three sides. While this was a more difficult hole, it defined the Mystic Rock experience. A bit hard to see, but there is in fact a snake beside my ball. To make our golfing experience even more interesting, we made a new friend along the way. As I drove my cart to find my ball after a drive, a harmless garden snake stood about a foot away from my ball with his head in the air defending it. My friends showed their Western PA side and removed it from beside my ball. On hole eighteen, we had another interesting experience worth noting. 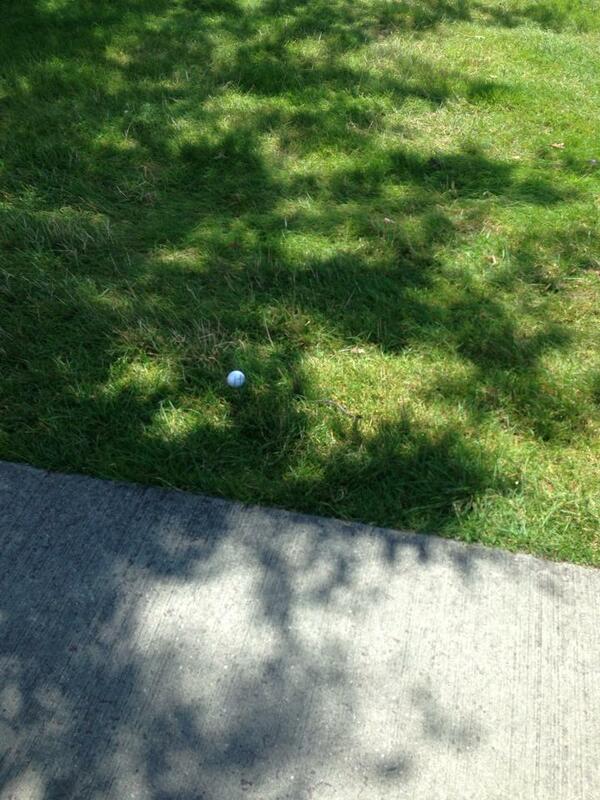 My friend Ian hit a beautiful drive but as it hit the wind, it drifted to the right. At the same time, a pickup truck was making its way down the road in the picture above. The ball literally fell on the road a second after the truck had passed, and we were glad that no damage was done. great time to spend with my friends before I head off for Carnegie Mellon in two weeks. I would highly recommend Mystic Rock to anyone looking for a scenic, pro-level course to spend a day at and relax. I hope to return in the future, maybe even with a company of my own! My post would not be complete without thanking Melanie and her family for getting me the tickets as a graduation present. Over the past 18 years, they have practically been family, and I will miss them greatly as I head off to college. I thank you greatly for giving this experience to my friends and I, and I am sure that none of us will forget the time we had at Mystic Rock!